Upcoming days in Waregem will be not only about the season opening, but also about construction of the new north grandstand. The structure was granted approval last week by the city council, which means work can now begin. The new north end will accommodate no less than 1,400 standing places (convertible to seating for UEFA games) for most vocal fans. 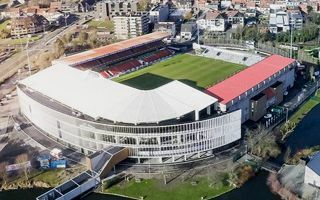 Zulte-Waregem are using the summer break to finish as much work as possible and it seems the club will allow fans as soon as this autumn, maybe already in September. Third phase of the project (east stand redevelopment) is expected to be launched in 2016. Last element will be the west grandstand, which is scheduled for revamp in 2017. Altogether the conversion of Regenboogstadion is expected to cost €25 million ($28m).